An app that let’s you visualize popular places. Search the map to discover places. Use the heat map as a guide. Check out the crowd before you go. Use Populace to see how many people are at specific venues, avoid the crowds, or go where the action is. 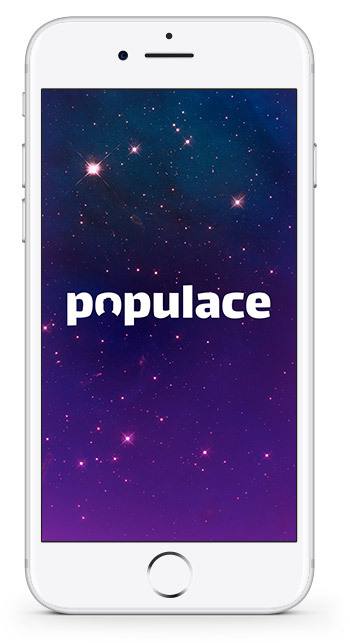 Use Populace to see how many people are at specific venues, so you can avoid the crowds or, go where the action is. Checkout where the crowds are. Join them or avoid them, with Populace you now have a choice. Our system blends social media with internet devices to visualize the popularity of specific places. By knowing when things are getting crowded, you can get there first and save your favorite place. Populace is the world’s-best community platform for visualizing popular places. 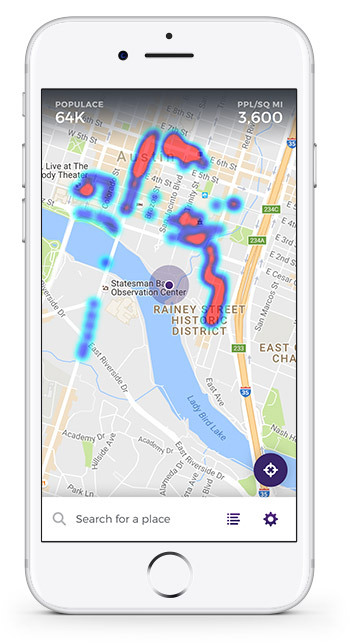 We catalogue, predict, and interpret crowd density with a map-assist capability. 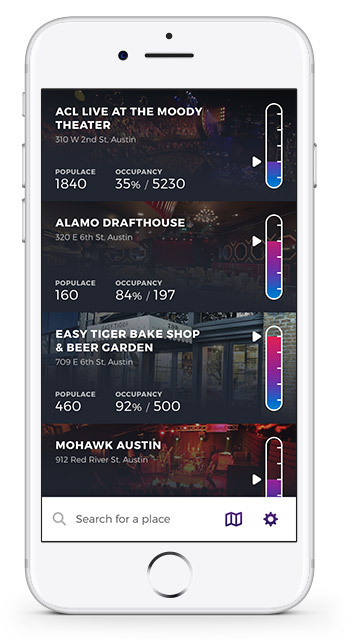 This first-of-its-kind capability provides our users with an advanced look of popularity of their favorite local venues. It’s simple, Populace is a mapping assistance technology, allowing you to search and zoom into specific locations. The map will display “hot spot” areas that represent densely populated areas. You can also change to a “list view” which will provide capacity and other details for local venues. How do I use Populace? It’s easy, just use our web or native mobile applications. No need to create a user account, we will prompt for access to your device’s location to complement our data quality. This is 100% anonymous, no need to create a password or share any private details. What if Populace is not available in my location? Be patient, we are on-boarding users around the world. While we hope to reach every corner of the known and unknown world, the Populace community will grow to reach your desired locations. How does Populace protect my personal information? We operate around a few simple rules; 1) we do not collect any personal information, 2) we don’t store location information beyond it’s operational use, 3) we use your anonymous feedback to improve the ratings of popular places. © 2017 Solid State Design, Inc.